The Best Sport Psychology blogs from thousands of top Sport Psychology blogs in our index using search and social metrics. Data will be refreshed once a week. Sport Psychology newsletter is a comprehensive summary of the day's most important blog posts and news articles from the best Sport Psychology websites on the web, and delivered to your email inbox each morning. To subscribe, simply provide us with your email address. London, England About Blog BelievePerform is a website developed to focus on all areas of sport psychology. BelievePerform joined forces with The Performance Room and together they are on a mission to help the world think, prepare and perform like elite athletes. Our mission is to increase the awareness of sport and exercise psychology among the sport community. Facebook fans 22,485. Twitter followers 80,823. Orlando, FL About Blog Improve mental toughness with sports psychology strategies from mental training expert, Dr. Patrick Cohn. Improve performance with sport psychology coaching. Facebook fans 2,729. Twitter followers 3,027. Morristown, NJ, USA About Blog Garret Kramer, Founder of Inner Sports and Author of Stillpower, teaches the states of mind that allow athletes, and all individuals, to excel. Their clients include business leaders, Olympians, NHL, MLB, and collegiate players and coaches, and they often conducts seminars and workshops about Garret Kramer’s “inside-out” paradigm for performance excellence. Facebook fans 13,852. Twitter followers 11,374. All around the world About Blog Dr. Michelle Cleere offers sport psychology coaching to elite performers and helps them develop a peak performance system for each unique situation. Helping others overcome their performance challenges and tap into their maximum potential is Dr. Michelle’s passion, mission, and promise. Facebook fans 300. Twitter followers 2,797. About Blog Weekly posts about sport psychology, for athletic success and mental health. Facebook fans n/a. Twitter followers 5,697. About Blog Sports psychology for tennis players. Learn powerful mental game of tennis strategies to improve your tennis confidence and mind game for tournaments. About Blog The Ultimate Sports Parent blog at Youth Sports Psychology. Sports parents and coaches learn how to instill confidence and success in young athletes. Do your athletes struggle with doubt, anxiety, frustration or under performance? Learn how mental training can help young athletes succeed. Here, you'll learn proven mental game skills for sports and life! Facebook fans 2,819. Twitter followers 3,068. Philadelphia, PA About Blog Sports Psychology Today is the top ranked online sports psychology training resource for athletes, coaches and sports parents. Sports psychology helps athletes. Our goal is to provide our readers with the highest quality sport psychology and mental training resources to help improve their overall performance, get the most out of their practice and enjoy their athletic experience. Facebook fans 8,566. Twitter followers 14,591. About Blog InnerDrive is a mental skills training company. We cover the traditional areas of sports psychology and mindset training. Our work covers the traditional areas of performance psychology, sports psychology and neuroscience through workshops, blogs and practical resources. Our origins are in working with elite athletes, that include Premiership footballers and GB athletes. Facebook fans 1,474. Twitter followers 12,571. Palm Beach, Florida, USA About Blog Discover how clinical sports psychologist Dr. John F. Murray can improve your performance and mental toughness in golf, tennis, football and other sports. Facebook fans n/a. Twitter followers 888. Canada About Blog The Canadian Sport Psychology Association (CSPA) is an organization devoted to applied sport psychology. Applied sport psychology involves facilitating the development of mental and emotional skills,techniques, attitudes, perspectives, and processes that lead to performance enhancement and positive personal development. Facebook fans 417. Twitter followers 917. About Blog Soccer psychology and mental game articles for soccer players and coaches to improve mental toughness and confidence. Test your mental skills for soccer. About Blog Sports psychology blog by Clyde Brolin, author of In The Zone - a new book about the mind of the world's biggest stars of elite sports. Clyde Brolin spent over a decade working in F1 before moving on to the wider world of sport - all in a bid to discover the untapped power of the human mind. Facebook fans 92. Twitter followers 1,041. Edmonton, Alberta About Blog Flow Performance is a resource for anyone seeking an edge to their mental game. Providing quality sport science services in the form of sport psychology and mental performance training. Facebook fans 698. Twitter followers 528. San Diego, CA About Blog High performance coaching firm specializing in the mental training of high performers including athletes, and individuals in the military and business. Facebook fans 249. Twitter followers 456. Columbus, Ohio About Blog Steve is the creator of Mindurance, LLC and a licensed counseling and sport psychologist in Ohio. He received his Ph.D. in Counseling Psychology from the University of Akron where he also developed a specialized knowledge in sport and performance psychology. MINDURANCE, LLC is an organization dedicated to creating products and services that help people live the lives they want to live. Facebook fans 288. Twitter followers 154. Vancouver, WA About Blog Sport Psychology and Running Coach combine to achieve your running potential. Team and Individual Sport Psychology training sessions to reach your mental and physical potential in running. Weekly-ish running or sport psychology related topics discussed here at Whisper Running! Facebook fans 155. Twitter followers 7. About Blog Hockey Psychology and Mental Toughness Tips for Players, Coaches, and Parents by Peak Performance Sports. About Blog Altius Performance Works helps athletes and performers of all stripes master the obstacles of peak performance. Using a host of strategies--behavioral, cognitive, and expressive-- Matt helps performers become their absolute best, both internally and externally. Working in collaboration with the athlete and their whole system, Matt sparks the fire of transformation, connecting performers with the joy of their endeavor & the power of self-knowledge. About Blog Enhance athletic performance and maximize potential with mental toughness training. We help athletes, coaches, and sports teams take their game to the next level. Discover skills to effectively set goals, improve concentration and focus, and effectively deal with setbacks. Overcome obstacles that are holding you back. Chicago,IL About Blog A sport psychology organization that helps clients pursue excellence in sport, exercise, and career through mental skills training and wellness strategies. Here we provide tips, strategies, stories, and more, all aiming to help you reach your full potential. Facebook fans 551. Twitter followers 97. About Blog Our research laboratory, shared by Drs. Mark P. Otten, Ashley Samson and Jacob Jensen, welcomes students with an interest in sport, and/or the pursuit of sport and exercise studies in graduate school. This lab's research interests vary widely across the field of sport and exercise psychology, and spans the CSUN departments of psychology and kinesiology. Birmingham, AL About Blog Dr. Richard Trammel Sports psychology consultant at Level 3 Sports. Our mission is to assist any athlete in the pursuit of helping them realize their full athletic potential with techniques and guidance designed to free the mind of fear & obstacles and fill it with the joy of sport. Facebook fans 25. Twitter followers 10. Yorkshire, UK About Blog Blogger Simon Hartley, Performance coach, sport psychology coach, author and speaker. Finding out what differentiates the world's best. For over 20 yrs I've been coaching individuals, teams & organisations across the globe to engineer their mindset and maximise their performance. Facebook fans 52. Twitter followers 1,622. Facebook fans 891. Twitter followers 2,953. Puerto Rico About Blog As a Clinical Sports Psychologist, I have the additional specialist skills and training to help athletes address other areas, such as limiting or problematic eating (eating disorders), over-exercise or exercise addiction, and limiting perceptions of body image. Blog by Dr Victor Thompson. Isle of Man About Blog Welcome to onpoint.im, a blog for athletes, parents and coaches, providing information on sport psychology & mental skills training. About Blog Carrie’s program helps increase focus and awareness, while turning adrenaline and tension into valuable cues for success in life and sport. With Carrie’s guidance, you can identify the physiological and emotional charges that may derail performance in athletic competition – or any other goal-oriented aspect of life. She calls this heightened awareness state one’s unique MindZone. Facebook fans 189. Twitter followers 79. England, United Kingdom About Blog Dan Abrahams is a global sport psychologist, working alongside leading players, teams, coaches and organisations across the world. He is known for his passion and ability to de-mystify sport psychology, as well as his talent for creating simple to use techniques and performance philosophies, and he is the author of several sport psychology books as well. Facebook fans 1,295. Twitter followers 24,798. Portland, OR About Blog Sport Psychology Institute Northwest is the premier provider of Sport Psychology Services and Mental Game Training for competitive athletes and coaches in Portland and the northwest. All of our consultants have played collegiate athletics, have coached elite level club and high school teams, and have children who play sports. Facebook fans 4,009. Twitter followers 580. New York City About Blog Dr. Jonathan Fader is a licensed performance & clinical psychologist. He is the Director of Mental Conditioning for the New York Football Giants & served as the team psychologist for the New York Mets for 9 seasons. He is the Author of Life As Sport. Facebook fans 2,824. Twitter followers 3,562. About Blog Mission is to use proven sports psychology techniques and quality instructional design to help athletes and other professionals achieve a superior mental game and their personal peak performance level. About Blog The Association for Applied Sport Psychology (AASP) is an international professional organization that promotes the ethical practice of sport psychology. Facebook fans 6,344. Twitter followers 5,540. About Blog Sport Psychology for Coaches is a free resource designed to provide coaches with credible and up to date sport psychology information to use with athlete. About Blog A Blog on the Application of the Exercise and Sport Psychology. 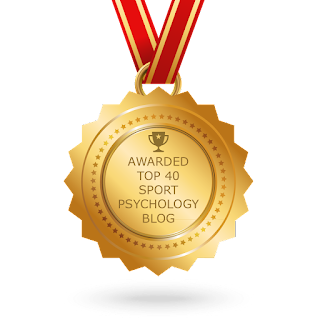 CONGRATULATIONS to every blogger that has made this Top Sport Psychology Blogs list! This is the most comprehensive list of best Sport Psychology Blogs on the internet and I’m honoured to have you as part of this! I personally give you a high-five and want to thank you for your contribution to this world.